Air source heating is growing rapidly in popularity. At Zing Energy we are receiving lots more enquiries about this eco-friendly way of generating energy. The benefits are clear. Air source heating is renewable, hassle-free to install and will lower bills. Plus there are several incentive schemes from Government enabling you to minimise set up costs. 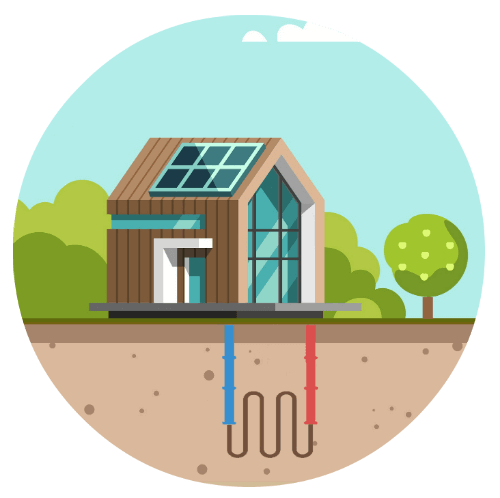 But how do air source heat pumps work and is it right for everyone? We answer your top questions below. What is air source heating? An air source heat pump (ASHP) is a heating system which works by transferring heat from the outside to the inside of a home, office or building. It transfers energy in a similar way to how a fridge keeps things cool. In fact, air source heating can also be used as a cooling system during warmer months. Air source heating works by transferring outside heat into a fluid at low temperatures. This fluid then passes through a compressor where its temperature is increased, and transfers its higher temperature to heating and hot water systems. What types of air source heat pumps are there? There are two main types of ASHP systems: An air-to-water system works with your wet central heating system. Air to water heat pumps take heat from the outside air and transfer it to a water-based system via pipes and radiators. This heat can be used for central heating or as a hot water supply for the house. Air-to-air systems produce warm air which is circulated around your home via a network of fans. It can’t be used for wet central heating systems. The amount of heat that can be transferred to your home by an ASHP does depend on the outside weather. The efficiency is reduced in colder weather so you may need to have a backup source of heating available for when the outside temperature drops. This could be the gas mains, electric mains, or other forms of conventional heating. Alternatively you can purchase metal canisters that are filled with gas, which tend to have low costs. Given the weather in the UK in the past year, you are unlikely to have needed this! How do you install air source heating? A specialist consultant would discuss with you your requirements and the best system based on your needs. ASHPs are very easy to install, without any need for extensive groundworks. The trusted plumbing & heating engineer simply places the ASHP on a flat concrete base connected to the heating pipes and electrical power cable running from the set up unit into your property. Can air source heat pumps work with radiators? Yes, the absorbed heat from outside is increased and can be used for radiators. However ASHPs can perform better with warm air heating via fans or underfloor heating systems because of the lower water temperatures required. Do air source heat pumps need servicing? One of the benefits of a well-installed ASHP system is that it really requires very little maintenance, with a lifespan of at least 20-30 year. However an annual check is advised. Zing Energy offers this service as standard. We provide details of your system’s exact maintenance requirements, and also how to optimise your system’s performance to boost efficiency and save money. Do air source heat pumps save money? This really depends on which type of heating system you’re replacing. If you are replacing an electric storage heater system it could equate to savings of up to £1,000 per year. For gas it would be less. A consultant from Zing Energy would be able to give you an accurate estimate of savings based on your system and previous bills. Are air source heat pumps worth it? ASHPs are usually installed outside of a home as there’s a lot more space. Rather than taking up room inside, they are outside and out of the way. Where space is limited, air source will always be a more cost-effective than ground source and less disruptive option than drilling boreholes. Air source heat pumps have a long lifespan and they don’t require too many regular services. Air source heat pumps can lower the cost of an energy bill and they are a lot cheaper to run than other heating systems. Additionally, as they can be used as a cooling system the air source heat pump costs also cover the fact that they double as an alternative to fans and air conditioning units. This can be a huge benefit with temperatures increasing in the summer months. As well as heating a home, air source heating also heats up water. This water can be used immediately or stored for use later; this is especially useful in a busy house with a lot of occupants. As ASHP systems use outside air, they have a low carbon footprint. There’s no need to use gas, oil or wood. Plus, there’s no need to find room to store fuel. How much do air source heat pumps cost? This can vary, ranging from £6,000-£10,000. However there are a range of Government incentives and grants available, such as the Domestic Renewable Heat Incentive (RHI) for an air source heat pump which can equate to £9,100. Zing Energy can help you access the right grant to minimise your upfront costs and start saving you money. At Zing Energy we offer renewable energy products and specialist insulation. Get in touch today on 0330 808 4365 to find out more.